We announced the Techsoup Digital Storytelling contest (TSDigs 2012) in our last newsletter and several of you have responded back with interest in creating a one-minute video of your NGO activities. We are happy to support you and so here is a recap of the several popular webinars created by Techsoup that will definitely spice up your video. The first part of this three-part webinar series will focus on all the decisions you need to make before you start recording your video. Watch this webinar to learn how to tell your story in a way that touches your audience and moves it to action. This includes understanding the basics of good storytelling, translating that story into a script and/or production guide as well as where to find great auxiliary tools and resources to really make your story shine. Step 3: So you have your video footage, now what? According to Guest expert Aaron Bramley,co-founder and director of communication/education, Lights. Camera. Help. there are three versions of a digital story: what you plan, what you capture, and what you edit and produce. The version of the story you edit and produce is most important version. The type of equipment you have available and choose to use affects each of these three story versions. Editing and post-production does not have to be expensive and, in fact, many digital storytellers already have access to the tools they need. Many storytellers begin the video post-production process on their computers. Watch the video to learn all this and get going on your video now! While submitting your entry, in the question How did you hear about TSDigs? do mention "bigtech". this way we can followup with techsoup and offer you further support beyond the contest. From where do I download the licenses? From where do I download the product keys? I am unable to see the products that I have ordered? "We were in the middle of a crisis when our Exchange server had become old and reached its maximum limit and we had to upgrade the hardware and software." Microsoft Exchange's major features consist of email, calendaring, contacts and tasks; that work with Microsoft Outlook on PC and Mac, wireless synchronization of email, calendar, contacts with major mobile devices and browser-based access to information; and support for data storage. "As an NGO, it was very expensive for us to buy licensed software and licenses at market rate. With the help of BiGTech’s software donation program support, now we have the licenses of windows software’s and the new version also." "And with the help of New Microsoft Office 2010 we can prepare documents, spreadsheets and presentations in a better and easy way which is a very important thing for our organization. We have been able to optimize the work flow and productivity due to having the latest in technology provided to us through Bigtech." says President of Winrock International India, Dr. Kinsuk Mitra. Both products Microsoft Exchange and Microsoft Office 2010 are available as donations for NGOs in India. Write to us on bigtech@nasscomfoundation.org for more details. Before receiving donations we had purchased software from the market with a time consuming process of procurement and spending our hard earned donations on it. By using latest technology we have setup automatic backups and also system images are taken which has reduced our manual back up work and given easy system restoration of PCs. Use of Office 2010 as an office application has helped us in improving office correspondences and updation in training modules. It helped us as well as our members/blind students in exploring and usage of latest windows and office software. 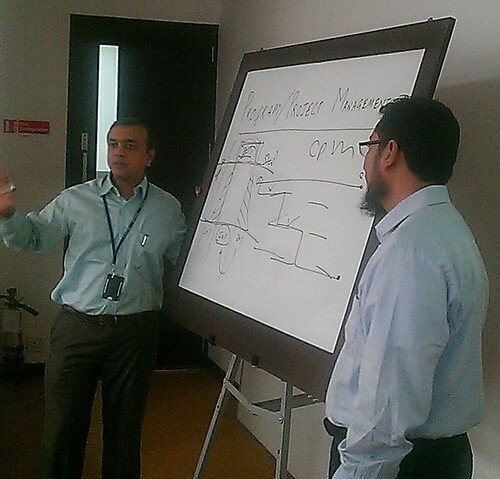 NASSCOM Foundation arranged its corporate volunteers to conduct a program management workshop for NGOs in Mumbai. The main goal of the workshop was to create a platform for NGOs to interact with the corporate world on the best practices in managing multiple projects, human resources, fund collections, overcoming sudden unforeseen changes, optimizing output, successful and effective implementation of projects. For this, MphasiS agreed to provide the venue (conference room) and also to work with Octaware and DBOI in putting together the curriculum of the workshop. The session started with volunteers from MphasiS giving an overview on how a program can be created - right from its conceptualizing to its planning and implementation. Jitesh Sashidaran gave a top-down view of how a program has a vision and also emphasized that the strategy should be in line with the organization culture. He was followed by Anand Nanavati who took the audience through the importance of effective leadership and communication in any program management. Very thought provoking! We had also invited Mr.Sajid Hameed, Executive Vice President, Octaware to share his profound knowledge of around 18 years in the field. He explained the finer aspects of Project Management and focused on how the manager should 'identify the critical path' in any plan. He suggested tips of distinguishing a successful project from an unsuccessful one in terms of “completion On Budget – On Time”. He stressed on the need for a 'Plan before Act'. Following Sajid's talk, we had an interactive session with the NGO participants. Muzna Menon and Shanti Taneja from DBOI shared their insights of program management. The discussions touched many topics and whether the donor was a partner or customer was very energetic! Ritesh Maniar from Mphasis shared his experience of 'team composition' in terms of performance and how a program manager can improve performance. By the end even the volunteers were happy to have gained an ngo's perspective on 'programs'. 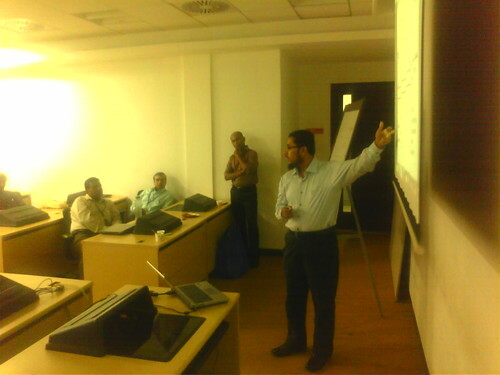 Sajid had also planned one of the sessions to be an exercise that the audience then did in groups. For a given brief, the groups were to define a Project Charter. This exercise too opened our eyes to some simple yet crucial aspects of any project. The corporate volunteers also joined the groups to handhold the ngo participants through the exercise. All in all, 17 of us were empowered within three hours due to the combined knowledge shared by Mphasis, Octaware and DBOI. We thank them for taking time out of their busy schedules of their official roles of Vice President, Project Managers, etc. Volunteering for Najeeb (Octaware) did not end with the workshop. He has contributed in drafting this blog too! Thanks, Najeeb. Buying a computer is a big investment. And with so many different options available, it can be hard to figure out how to meet the technical needs of your nonprofit and still stay within your budget. This guide will help you understand the questions to ask when shopping for a computer. It will also provide a quick reference checklist with definitions of some basic technology terms (not too many! ), as well as the minimum standards we recommend for computers. 1. Do You Need a New Computer? It's possible some basic maintenance tasks or a simple hardware upgrade can boost performance and give your old computer new life. 2. How Will You Be Using the Computer? If you do need a new computer, one of the most important things to consider is how you will actually use it. A technology plan, technology budget, and technology strategy are all helpful tools to make sure you understand your current and future computing needs. What kind of work will your staff be doing? Basic office tasks, like creating documents and spreadsheets, checking email, and using the Internet? Or heavy-duty work with video, audio, or images? Audio-visual work tends to be resource-intensive and will require a more robust computer. Will your staff be traveling, or only using the computer in the office? How does the computer fit in with your existing technology? What operating system(s) do you use? Operating systems, like Windows, use up a lot of your computer's resources. If you barely meet the minimum hardware standards for using your operating system, you may not have the computing resources to do a lot of other tasks at the same time (multitask). What software do you use? Do you have software that only works with a certain type of computer or only runs on a particular operating system? 32-bit and 64-bit? The key thing to know is that hardware and software come in 32-bit and 64-bit versions. If your computer has a 32-bit operating system or hardware, you cannot run 64-bit software on it. What are your future plans? Are you planning to upgrade your operating system or add a new kind of software? Are you planning to do different kinds of tasks in the next couple of years? The choice between Mac and PC often comes down to personal preference. Both types of computers have their merits. Macs and PCs use the same kinds of internal processors, so they are equally powerful. The main difference between Macintoshes and other computers is the operating system they use: Macintosh computers run Mac OS X (the latest version is called Lion), and PCs run Windows (the latest version is Windows 7). Macintosh computers are usually more expensive off-the-shelf than a similar PC. However, some argue that the long-term cost for a PC is actually higher, due to additional software and maintenance costs. There is some software that will only run on Windows. Make sure the software you depend on is compatible with your new computer's operating system. The more similar your computers are, the easier your technology will be to manage. If you have different types of computers, running different operating systems, and different software, troubleshooting and maintenance become much more complicated. Consider whether you already have a Mac- or PC-centric office and whether or not it’s worth switching some or all computers. 4. New, Used, or Refurbished? If you plan to use the computer for basic office tasks like word processing, email, and web browsing, you probably don't need a top-of-the-line or brand new computer. A used or refurbished computer may be just fine. Used and refurbished computers are usually much less expensive than new computers. They're also a greener option, since you're extending the life of an old computer, rather than buying a brand-new one. A refurbished computer may be a better option than a used or donated one. Refurbished computers are older machines that have been carefully inspected and updated by professionals. If you get your refurbished computer from an authorized professional refurbisher (and you always should), you will know it is in good working condition. Refurbished computers also often have a warranty of some kind. Fail and return rates. Check the refurbisher's fail and return rates. Warranty. You probably won't get a three-year warranty for a refurbished computer, but a three month warranty is pretty standard. This should cover any out-of-the box problems. Peripherals, software, and documentation. Make sure you know what is included with your computer. Refurbished computers, for example, rarely come bundled with a monitor. If you are buying a used (rather than refurbished) computer, or accepting a donated one, make sure a knowledgeable person inspects the computer thoroughly first. This will help ensure the computer is functioning properly and that it will meet your needs. Remember that as alluring as a free or very cheap computer might seem, an old one in poor condition can actually be more trouble than it is worth. 5. Laptop, Desktop, or Tablet? Price. Laptops are usually more expensive than an equally powerful desktop computer, even if you factor in the cost of a monitor for your desktop. Parts and repairs are usually more expensive for laptops as well. Travel. If you will only be using the computer in the office, a laptop probably isn't worth the added cost. Upgrade, repair, and maintenance. Especially if you're planning to do this yourself, keep in mind that fixing or upgrading a laptop computer is usually much more complicated than it is for a desktop computer. If you will be traveling a lot, size and weight are important considerations for laptops. Smaller models are often more costly than a comparably equipped standard size model. There is often a trade-off between small size and computing power. Inexpensive netbooks, for example, may not be powerful enough to serve as your main computer. Tablets (as handy as they can be and as popular as they are) aren't suitable for heavy use for office productivity tasks. But they're great for web surfing, checking email, and reading documents on-the-go. There are a few key things you should understand when you're making a decision about which computer to buy. We'll define them and provide the minimum standards you should be looking for to support performing basic office tasks. This is your computer's brain, and its function – as you might imagine – is to process information. Usually, a faster processor means a faster computer. Number of cores (single, dual, quad, and so on). Processor speed or "clock speed," which is measured in Gigahertz (GHz). Confusingly, memory is not the same thing as storage (see below for additional information). Storage is what allows you to keep files and software stored long-term, while memory is what your computer uses short-term to perform its basic functions. *32-bit operating systems can't use more than 4GB of RAM, so if you have a 32-bit OS, you don't need more than 4GB of RAM. Amount of memory, which is measured in megabytes (MB) and gigabytes (GB). There are 1024 megabytes in a gigabyte. The amount of information (files, data, software, photos, video, and so on) your computer can store. Amount of storage, usually measured in GB. The hard drive is where most of the information on your computer is stored. Traditional drives are a spinning disk attached to a platter. Because it has these rapidly moving parts, hard drives are susceptible to mechanical failure. For example, when your drive "crashes," it's because the spinning disk literally crashes into the platter underneath it. Solid-state drives do not have moving parts and therefore are less likely to have mechanical problems. They are also faster and quieter than traditional drives, but they are also significantly more expensive. Note: an external hard drive is basically the same thing as an internal drive. An external drive just has a case surrounding it and a cable to connect it to your computer. Disk size: the amount of storage space on the disk. How your computer connects to the Internet or networked devices. An Ethernet port lets you plug your computer into a router for "wired" access. A wireless adapter or wireless card enables your computer to connect to the Internet and other devices wirelessly. Bluetooth is a technology that allows your computer to wirelessly connect to other devices (but it doesn’t allow your computer to connect directly to the Internet). Wired and wireless connection capability. USB (Universal Serial Bus) – the current standard is USB 2.0, which provides a faster connection than the older USB 1.1 standard. Firewire (also known as IEEE 1394, iLink) provides an even faster connection for high-speed data transfer. VGA (analog) output is included on almost all desktops. DVI (digital visual interface) carries only video, not audio. HDMI (high-definition multi-media interface) carries both audio and video. Mini HDMI ports are often used on portable devices. Like HDMI, DisplayPort and Mini DisplayPort carry both audio and video. What devices you will connect to your computer. The graphics card or chip is what allows your computer to process and display visual information (text, images, video, and basically everything you see on your computer screen). Integrated or on-board graphics cards are built into your computer, and they share your computer system's main memory. A dedicated graphics card has its own, separate memory. If you have at least 2 GB of RAM, integrated graphics should be sufficient in most cases. If you work with a lot of digital video, you will probably need more RAM and/or a dedicated graphics card. Integrated graphics: fine for most everyday office functions. Dedicated graphics card: only needed if you're planning to work with a lot of digital media. Optical drives let you read and record (or write) to CDs, DVDs, and Blu-Rays. A "burner" or "recorder," usually labeled "RW" allows you to record or write information to discs. Most drives are labeled with the type of discs they are compatible with, as well as whether they can record or write to a disc or only play or read it. Devices labeled "ROM" can only play discs; they cannot write to them. Devices labeled "RW" allow you to write information to discs. For example, a DVD-ROM/CD-RW can play DVDs and can both play and record to CDs. What media you are using (CD, DVD, and so on). What devices can and need to read that data. Electronic equipment connected by cable (or wireless integration) to your computer’s CPU. Pointing devices (mice, trackballs, touchpads). Printers, scanners, and other optional devices. Display Resolution is based on the number of pixels (the little dots that make up the image you see on-screen) that can be displayed; more pixels means a sharper display. When not plugged in to an outlet, laptops use a rechargeable battery for power. Some laptops can have an extended battery added. This makes the laptop bigger and heavier, but significantly extends battery life. Some laptops have batteries that cannot be removed, which makes them more costly to replace when the battery wears out. Battery life: how long the battery retains power after charging. Desktops, laptops, and tablets come in different sizes. Full-size: these computers are encased in a standard (sometimes bulky) "tower" case. Compact: smaller than full-size towers (sometimes called "minitowers"). All-in-one: the computer and the monitor are all one piece. While we use the term "laptop" in this guide, "notebook" means the same thing. A netbook is a very small, lightweight, (and less powerful) laptop computer. Unless you will be traveling a lot, size is not usually a major factor when choosing a computer. Will this product meet our needs? What do you know about the company that makes the computer? Do they have a good reputation? What about the particular computer you're looking at? What kind of warranty do you get, and how long does it last? How good is the company's technical support, and how long can you use it? What other hardware comes bundled with the computer? A monitor, keyboard, mouse, cables? What software comes with the computer? The rise of social media and mobile technology has changed the way people process information. The 24/7 news cycle is overwhelming to many people. Websites that are burdened with too much text or too many images without consistency in size and color scheme can immediately lead to an exit response. Whether we like it or not, information overload is a part of our culture now, and the design and tone of your nonprofit’s website need to take this shift in communication seriously and present your website accordingly. Simplicity is the key.Your supporters also now expect a more social experiences from your website, or you may simply need to tweak your current design, but make no mistake: the general priciples and design aesthetics that ruled during the era of Web 1.0 are no longer applicable. anything they just want to leave your website. A good Content management System (CMS) will take care of this for you. scheme. In general, limit the use of colors to three or four. the subscription process as simple as possible. process as effortless and clutter-free as possible. supporters to give and take action in a way that text by itself simply cannot. send them the unintentional message that your website is managed by an amateur. As a general rule of thumb, keep widgets off your home page. BUSY offers a range of accounting softwares to cater to the needs of different business segments.